In this report I shall be comparing my letter with three professional letters. The three professional letters are: 1. BT 2. Vodafone 3. Haydon School In this report I will focus on: Style Layout Type of information Presentation technique Standards I will start with a description of my letter. My letter is intended for one person to thank them. There for I have chosen to write it in a formal tone and to make sure that it does its job well by say thank you. I have used language that I think is appropriate to make the reader know that we appreciate what he has done for the fame production. I chose to use an A4 size page and portrait orientation because I think it is the most formal way to present a letter. I have used indented paragraphing format left blocked. I have added the fame logo at the bottom so the reader knows who its from straight away, also to fill the page and make it look more presentable. I chose to use font size 14 and Times New Roman because it makes the writing on the letter clear to read. I have included my address, which I have placed in the top right hand corner because it makes the letter look formal. The type of information that I have used is text and graphics. I tried to present my information clearly taking care that I make the letter sound apperceive, as I want to give a good impression so he/she will keep supporting the school. ...read more. If I did my letter again I would improve it by writing a lot more in more detail, make it more interesting and add the address it is going to. On the whole I think my letter is very good and it does it job very well. Having compared the documents I feel that the best one is vodafone letter followed by mine then the Haydon School and last the BT To show my results in a graph I have given the documents a mark out of 10 for style layout and presentation. 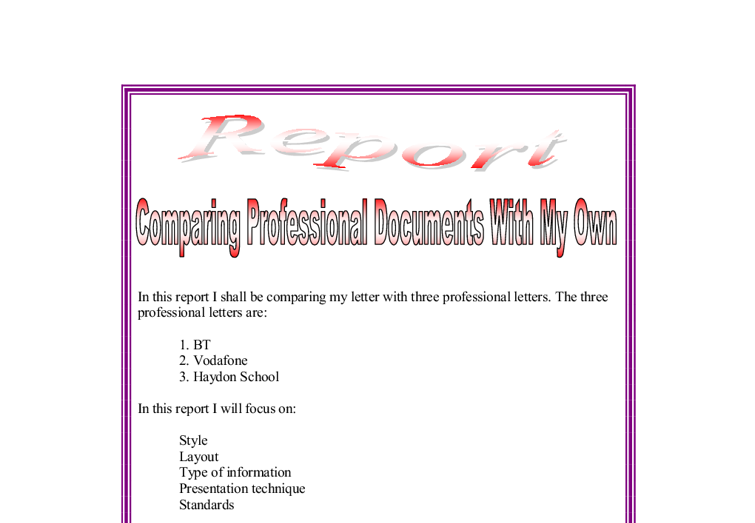 Document Style Layout Presentation Overall Mine 7 8 9 24 BT 5 5 5 15 Vodafone 8 8 9 25 Haydon School 6 6 8 20 In this report I shall be comparing my letter with three professional poster/flyer. The three professional letters are: 1. The fitness zone 2. Spice 3. Foley & Davis In this report I will focus on: Style Layout Type of information Presentation technique Standards I will start with a description of my poster/flyer. My poster/flyer is intended for the people who are involved in fame to come to the post fame party. There for I have chosen to write it in a formal tone and to make sure that it does its job well by telling people where it is and when etcetera. I have used language that I think is appropriate to make the party look good. ...read more. The poster/flyer has been done on piece of card on a 1/3 of A4 size page and is portrait orientation. It does not have a logo but it does have a picture of its shop. They chose to use graphics to do the picture of its shop the font size about 18 and Times New Roman. It includes their tel. no. and email address. The type of information that is used is graphics and text. The information is presented clearly. The text is formatted with colour and graphics I think the main similarities between my poster/flyer and the professional documents are. None of them have their own logo and they all use graphics. I think that the main differences between my poster/flyer and the professional documents are my text is bigger than the others, mien is a lot clearer, the others are advertising and all of the poster/flyers are different sizes. If I did my poster/flyer again I would improve it by making it more interesting and put it on card. On the whole I think my poster/flyer is very good and it does it job very well. Having compared the documents I feel that the best one is mine then the fitness zone followed by Foley & Davis and last spice To show my results in a graph I have given the documents a mark out of 10 for style layout and presentation. Document Style Layout Presentation Overall Mine 9 10 9 28 The fitness zone 9 9 9 27 Spice 6 8 7 21 Foley & Davis 7 7 8 22 Gary Harrison centre no 12924 candidate no 0105 ...read more. It is also used extensively as a web-based lecturer in online courses. Authoring is a very easy to learn and use software, which. "It provides a template with different background colour and graphics". Authoring program could be used on Macintosh and Windows computer and is not cost effect able . Job advertisements must be carefully planned out. Carlisles Fresh foods must decide how, when and where to advertise. The process of advertising a job vacancy must be given extensive thought as this can also be a costly process. The letter is very general. It has been created using mail merge, the letter has been sent to all the customers in the company's contacts database. The company has put the main points next to bullet points, this means the customer will remember the main points, this is what the company wants so it is well designed. 'As John Berger has argued in relation to the portrayal of women in publicity, 'men act and women appear. Men look at women, women watch themselves being looked at' (Dyer, G. Advertising as Communication, pp 92). Women like to be admired by men, but this would not be the case if they had just been raped. This could have adverse consequences for potential businesses; as if the general outlook is poor then it's a damaging environment for new businesses. Gross profit was also identifies in the survey it is useful for all potential business as it gives them a brief indication of revenue , and what is needed to brake even and intern profit. On the fifth page at the top the colour is green. This page shows what's on offer from getting a loan from Argos. Then on the last page there is a list illustrating the different kinds of loans. This flyer is colourful and clear for customers. Based on the experiences, students, home users and parents more likely to purchase in the shop, because VRD as a new technology, they need well-trained sales people provide lots of suggests and technical information and it is also easier for them to compare different products.